Mendocino Headlands State Park is directly adjacent to the village of Mendocino, and it actually surrounds the village on three sides. Trails follow the ocean all the way around the headlands, and this is a prime location for whale-watching during the season (late December through April). 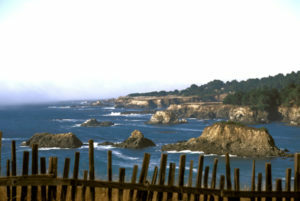 At the southeast corner of Mendocino, you’ll find one of the few white sand beaches in the area. Big River State Beach is situated at the mouth of Big River, and is subject to constant reshaping due to the strong tides and large waves here. This area was home to the Northern Pomo tribe for millennia before the arrival of European traders and settlers. Other inland tribes visited the coast annually to trade, hunt, and socialize with the coastal tribe. The Headlands feature a blowhole, the original 1850 lumber mill site, and fantastic ocean views. Park at the west end of Main Street, or go north to Heeser Road. Turn left to circle around the Headlands, eventually ending up at Lansing Street. Trails are readily accessible from Main Street and several parking areas along the way. The section of headlands along Heeser Drive provides the best opportunity to seemigrating whales in the winter. The Historic Ford House is the Visitor Center for Mendocino Headlands State Park. Inside find exhibits on local cultural and natural history, as well as visitor information regarding the town of Mendocino. Located on Main Street in Mendocino, it is a great place to begin your visit to the Mendocino Coast. Bear left (east) from the parking lot behind the Presbytrerian Church, and walk down steep but solid stairs to a lovely white sand beach, rock cliffs, and the mouth of Big River. Because of tidal action and large waves, this beach can reshape itself dramatically from one day to the next.